How to travel with vocal booth on a plane. Portable Carry-on Vocal Booth flying high! Can you take Carry-on Vocal Booth (COVB) and VOMO (Voice Over mobile recording studio) on a plane? I have traveled with COVB, and then VOMO, both domestically and internationally few times. USA, Europe, South America, China, and I was always allowed to have VOMO with me on a plane. It perfectly fits in the overhead bin of large planes, and in small planes they put it in a closet. This is why I said “YES”. “NO” is because it actually exceeds the maximum allowed size for the carry-on luggage. Airlines often specify that a carry-on bag may not exceed 45 linear inches (length plus width plus height). But this VARY on different airlines. Sometimes on the same route different connecting flights may treat the luggage differently , and what one airline allows, the connecting airline might disallow and they might ask you to check the luggage in. It never happened to me with VOMO, but it is possible. 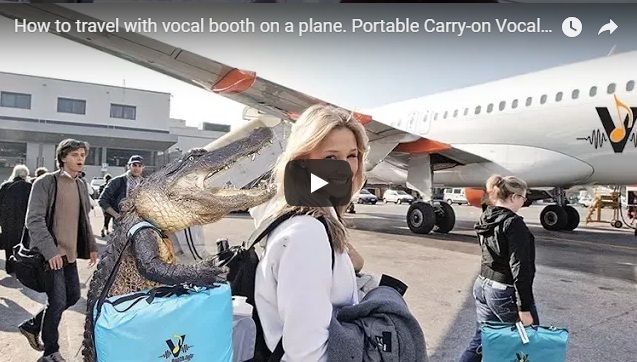 Why would you want to take the Portable Vocal Booth with you on a plane anyway? Well, sometimes on a long travel, there might be a long time between connecting flights. Sometimes it is more than 5 – 8 hrs. So if you have your Portable Sound Booth with you, you can turn that down time into a productive time. VOMO allows to carry all your recording equipment together. I realize that it might be difficult to find a quiet spot for audio recording at an airport, but VOMO does reduce the outside noise by about 10 dB, and a lounge is usually very quiet. VOMO is a Voice Over Mobile Recording Studio that can turn any environment into a perfectly suitable space for audio recording. It delivers consistent acoustics no matter where you are. Remember, It is NOT designed to be soundproof. That would be counterproductive. It is designed to cancel echo and reflections, so you can record clear direct sound as it was intended. And this VOMO does very well. From creators of Producers Choice Acoustic Blankets, VOMO portable vocal booth, and many more acoustic treatments to optimize sound absorption. Studios, Vocal professionals, Voiceover artists, Audio Engineers, and Home studios use our products everyday to control their sound environment. This entry was posted in For traveling Voice Actor, Instructional Videos, Portable Vocal Booth, Videos and tagged carry-on, portable vocal booth on a plane, record voice over on the road, voice over travel. Doing voice over on the road? Take your Recording studio with you! AVB33 Review.